Ice covered Lake Baikal in late January 2011, as snow coated nearby peaks. The Moderate Resolution Imaging Spectroradiometer (MODIS) on NASA’s Aqua satellite captured this natural-color image on January 24, 2011. 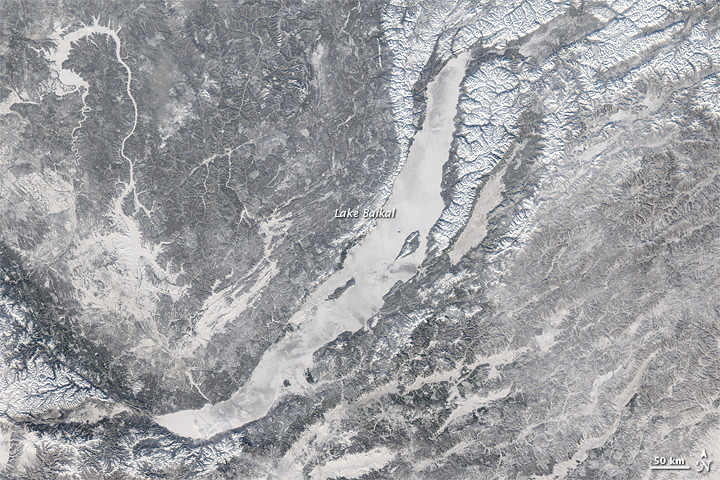 Ice on Lake Baikal is not at all unusual in January. The ice that forms on the lake is generally quite strong, even strong enough to support the weight of vehicles driving over the surface. Runners also rely on the ice to support their weight in the Lake Baikal International Ice Marathon. Although the ice on Lake Baikal is often thick in January, the lake rarely freezes early in the fall. The lake’s considerable volume enables it to retain heat accumulated during the summer months throughout the autumn season. In extremely cold conditions, however, the lake may freeze as early as December. Lake Baikal (also known as Ozero Baykal or Ozero Bajkal), is the world’s oldest and deepest freshwater lake. At roughly 395 miles (635 kilometers) long, with an average width of about 30 miles (50 kilometers), it is also the world’s largest freshwater lake by volume, holding as much fresh water as North America’s Great Lakes combined. Surrounded by mountains, the lake occupies a rift where parts of the Earth’s crust as wrenching apart. Geologists value the lake for what it can reveal about the development of ocean basins. Encyclopedia Britannica. (2011). Lake Baikal. Accessed January 24, 2011. Lake Baikal Travel Company. (2010). Baikal Ice. Accessed January 24, 2011. U.S. Geological Survey. (2011). Lake Baikal – A Touchstone for Global Change and Rift Studies. Accessed January 24, 2011. NASA image courtesy Jeff Schmaltz, MODIS Land Rapid Response Team at NASA GSFC. Caption by Michon Scott. U.S. Geological Survey. (2011). 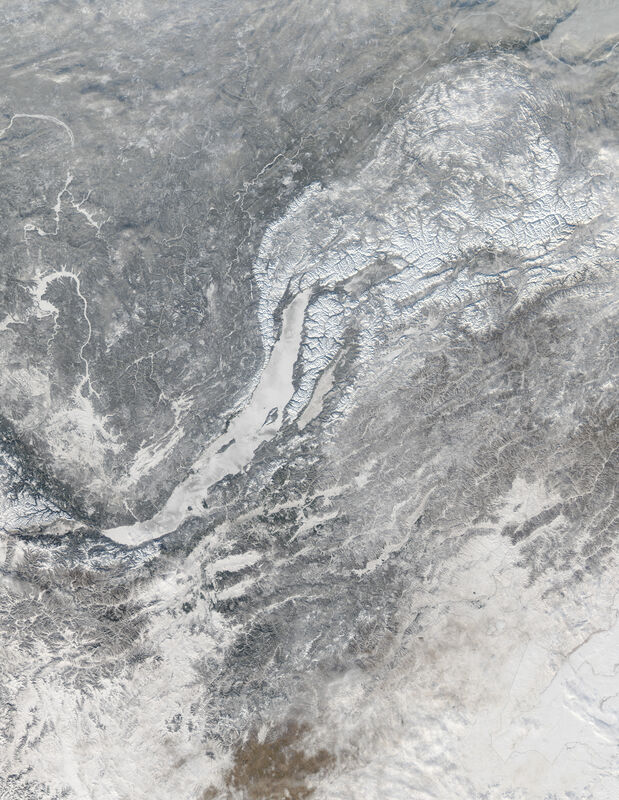 Lake Baikal – A Touchstone for Global Change and Rift Studies.Accessed January 24, 2011.